This is one of my family’s favorite meals. Forbidden (black) rice and quinoa is such a great combination and so flavorful when seasoned with tamari. Steam and chop the green beans. Rinse under cold water and set aside. Press the tofu, cut into squares, and toss with cornstarch. Heat sesame oil in a non-stick skillet and toss around until all sides are crispy. Take the tofu out of the skillet and add the green beans. Pour marinade over them (keep the bowl handy) and cook on medium until the sauce thickens. Pour green beans into a strainer over the marinade bowl. Put the tofu back into the skillet and pour the marinade over it. Toss to coat. Thinly slice one scallion per plate and set aside until ready to plate. Dice the onion and sauté in sesame oil in a sauce pan. When translucent, add the rice and quinoa and water and cook until water is absorbed. Add tamari and mix well. 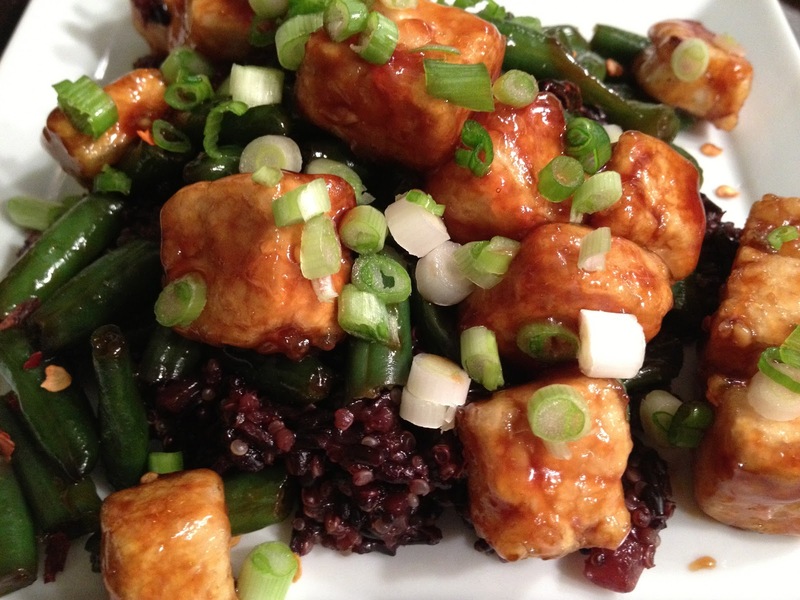 Plate the rice, top with green beans, add a pinch of red pepper flakes, top with tofu and garnish with scallions. Enjoy!